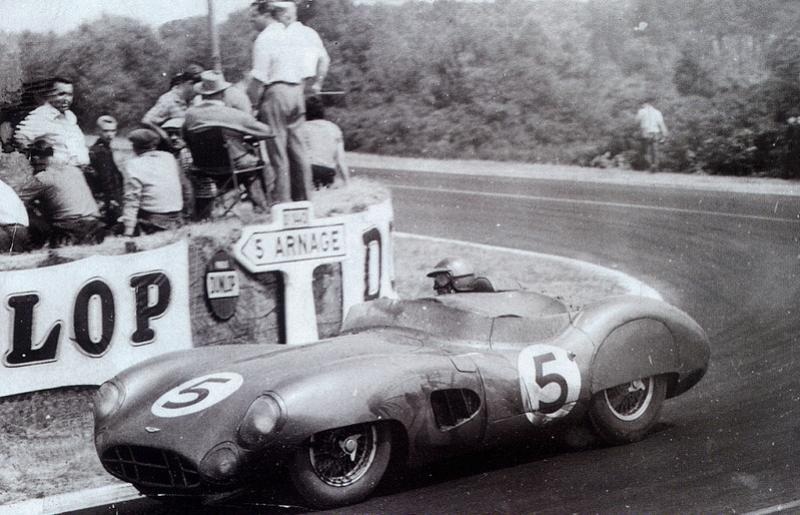 In 1956 the four was installed in a new Vanwall with chassis by Colin Chapman and aerodynamics by Frank Costin, by 1957 it was a winning combination. 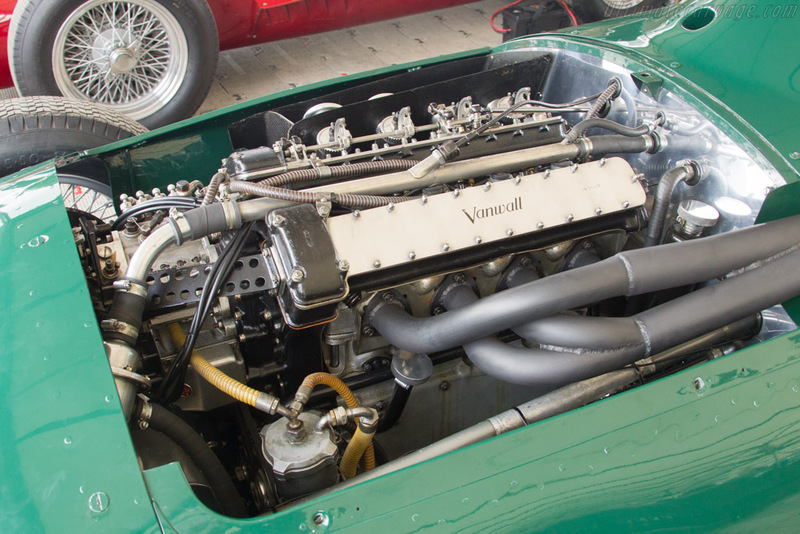 Vanwall built 7 in all 2.5-litre engines designated V254. 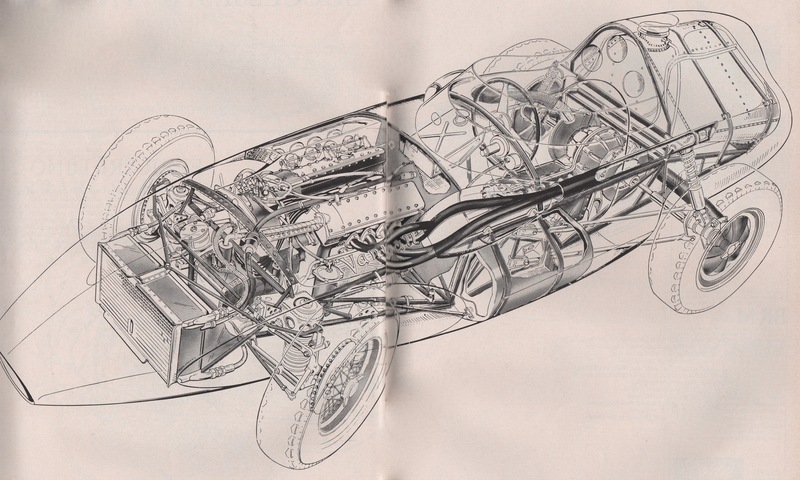 Composed of high-topped, deep-walled crankcase in RR53 aluminum alloy into which individual cast-iron cylinders were deeply spigoted, a water jacket and a shallow cylinder head in RR50 alloy with separate camboxes and exposed valve springs, the whole held together by 10 long high-tensile-steel tie bolts from the head to the main bearing caps. Nestling inside the tie-bolts and topped and bottomed by rubber sealing rings, the cast RR50 aluminum water jacket steadied and sealed the whole assembly. A structural role was played by the cylinders, which fitted into a radiused countersink in the head. Skirts of the crankcase extended bellow the crankshaft center line. A deep finned sump capped the bottom. BP oil was used. An EN19 forged 5 main bearing crankshaft was used. EN24 nickel-steel forged con-rods had I-section shanks, were machined all-over and polished. RR59 aluminum alloy piston with full skirt were forged by Hepworth and Grandage, had 2 Dykes compression rings and 1 oil control ring. Cooling oil jets were used to cool the underside of the piston crown. A compact cylinder head with hot water extracted from it by a manifold between the cams. A water pump mounted low at front of crankcase driven by an extension of the oil pressure pump input shaft. Symmetrically inclined valves at an included angle of 60 degrees and seating on bronze-alloy inserts. Exhaust valve guides were finned and in direct contact with water. All gears drive to cams were housed in a magnesium casting bolted to block and head. All spur gears ran with ball bearing with 1 idler rotating a single BTH magneto. 2 KLG plugs per cylinder were used. A 3 pinion scavenge pump was used. Each cam rotated in its own case. Cylindrical hollow tappets sliding in bronze guides. 2 hairpin springs per valve placed out in open air. Bosch fuel injection pump with injector in inlet port just upstream of valve seat injecting at 650psi. Amal carburetor bodies and their control system served as slide throttles. Inlet opens 70 degrees BTDC. Inlet closes 90 degrees ABDC. Exhaust opens 75 degrees BBDC. Exhaust closes 49 degrees ATDC. 1958 Borgward RS 1.5-litre four: This was the fuel-injected 16-valve four engine that seriously started troubling Porsche 1-1/2 litre sports car racing and hill-climbs categories; in 1959 it was used in F2 in a Cooper chassis. Stirling Moss won the British F2 championship in a Cooper-Borgward. The RS four was the work of designer Karl Ludwig Brandt, a pre-war veteran of BMW’s experimental department. A forged 5 main bearing crankshaft running in trimetal Glyco bearing shells. Forged I-section shanks con-rods that were polished to a chrome-like finish. A Silumin block/crankcase casting with extended skirts well below crankshaft center line. The main bearing caps were located laterally by pins to crankcase walls. Cylinder head studs penetrated the block to do double duty as the main bearings cap studs. Except for connection to injection pump, every oil line was drilled in place. A 10-litre dry-sump system with shallow cast oil pan slopping to a central pick-up connected by a cast-in piping to scavenge pump housed in lowest part of cam-drive cover. Scavenge and pressure pumps were placed at right and left of cam-drive. Both pumps rotated at 0.6 engine speed by spur gears at crank nose. Centrifugally cast iron cylinder liners were sunk wet into the block, very tightly at the bottom and sealed by 2 O-rings seals at the top of liner. 8 ‘feet’ radiated out to rest on a ledge within the block, like JANO’s Lancia D50 and Dino Ferrari construction. Camshaft drive was by a 2-stage double roller drive at front of block, with adjustable idler sprockets. Camshafts and sprockets were joined by a coupling of 2 conicaly tapered rings which when pressed together by a central bolt expanded to lock the end of the cam to the sprocket. Infinite variation of valve timing was therefore possible. Exhaust valve closing and inlet valve opening points were equally disposed at 42 degrees from TDC, giving 84 degrees of overlap. Steel camshafts ran directly in bores through the removable cam cases. A Bosch racing distributor was driven from rear of inlet cam. Cam lobes contacted cast-iron cup-type tappets. Symmetrically inclined at 32 degrees from center line were the 4 valves per cylinder. 2 spark plugs per cylinder were used. Injector nozzle sprayed through a 10mm hole. Mahle forged aluminum alloy pistons with the crown specially anodized to a deep graphite grey, had 2 Dykes compression rings above a single oil ring. Fuel injection by Bosch 4 plunger pump was at a pressure of 1000-1100psi. Valve overlap at TDC 84 degrees. Inlet valves gas-velocity at 7500RPM 208 feet per second. Well, thanks for setting the record straight. Stivala: Your call, we could remove the links and leave the pictures only. Do you have a better link, Tommy Cookers? Edit: The offending link eventually got removed. But if anyone is interested, it is the same page where the third picture came from. Yes remove the links but leave the pictures, those Borgwad engine picture are authentic and Hard to find . Some of the 50 most famous engines were not famous for their success in F1, the Borgward was one of them. @Nokivasara, Thanks for those links. Any additional input and comments are greatly appreciated, and you sure have a point about the throttle wire, I notice that there is another shaft with lever arm that seems to operate the throttle shaft that have the quadrants that pulls the individual throttle cables above it. 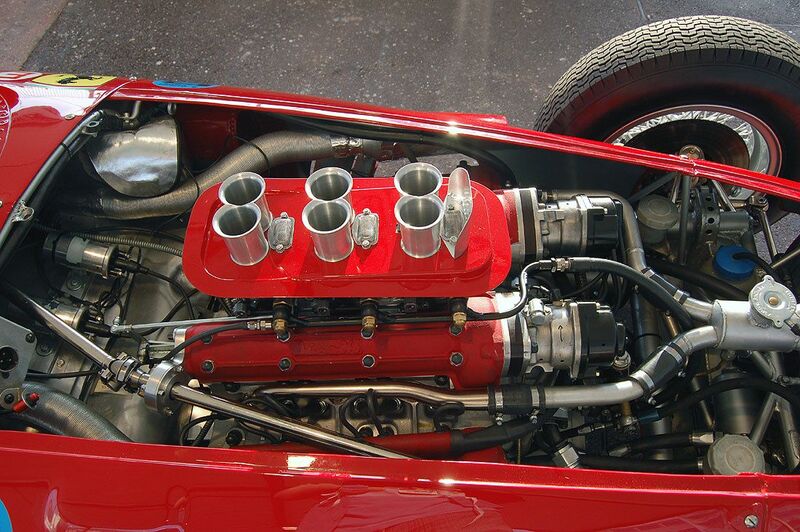 The new series of Ferrari V6 engines was called Dino after the death of Enzo Ferrari’s son Alfredino. With guidance of Vittorio Jano as consultant the V6 concept arrived at Ferrari from Lancia were it had been developed for sports racing use by Jano and Francesco de Virgilio. Its implementation at Ferrari was by Franco Rocchi under the direction of Andrea Fraschetti who was killed while testing a Dino single seater. This engine was produced in many sizes and with many upgrades. 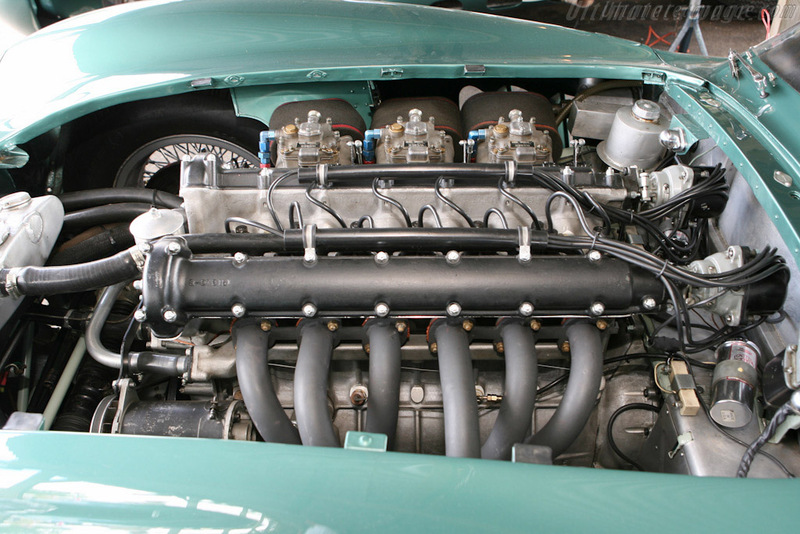 In the 1950 a V6 was virtually unknown engine type, its adoption by Ferrari was surprising, no less surprising was the adoption of a vee of 65 degrees angle between the cylinder banks with its unequal firing impulses. Both 60 and 65 degree vee angle engines were build and tested. The 65 vee angle was chosen, development started with a 1.5-litre V6 formula 2 engine. The next up was a 1860cc engine, and then to 2195cc and after to 2417cc. this was for first formula 1 season in which aviation petrol was mandated instead of the exotic methanol-based brews which were banned. Having decided on a 65 degree bank angle Rocchi provided a crankshaft that had individual big-end journals for each con-rod for even firing intervals. Wet cylinder liners clamped between block and head were used. With liners counter-bored 1/12 inches down in the block. Metal to metal head gasket was by a metal insert ring. 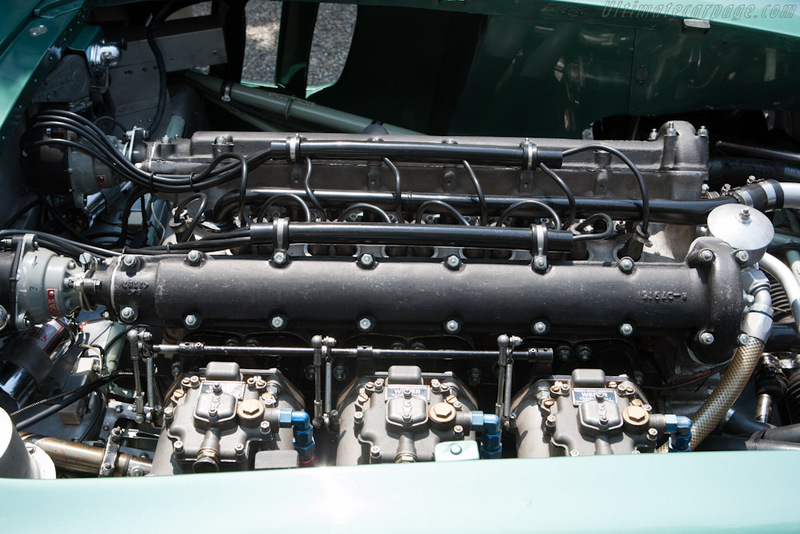 An angled split con-rod was used on the 1.5l engine but were not needed on the bigger bore engines. An I-section con-rod with a 3-ring piston above the gudgeon pin were used. Wide cam-lobes on Jano-type mushroom tappets which screwed onto the valve stems for adjustment, each cylinder head had its own duplex roller chain driving its camshafts, the chains were driven by a pair of meshing gears rotated by the crank nose, the cams of each cylinder bank rotated in opposite direction, an intermediate idler pulled down the chains. Chain cam drives remained an exception future for formula 1 engine. Valves were splayed at an included angle of 60 degrees, 2 14mm-spark plugs per cylinder were sparked by 2 double-circuit Marelli magnetos with dual rotors and contacts. 3 double-bodied 42DCN downdraughts Webers units placed in a row down the center of the vee mounted on a single aluminum incorporating paths to the ports. 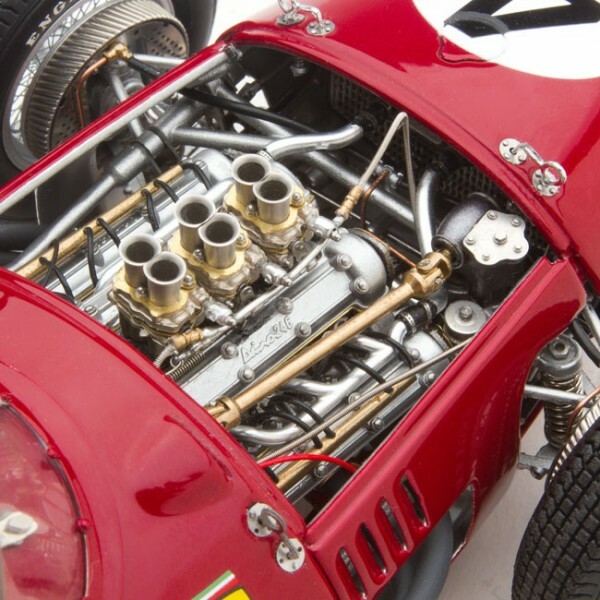 As raced in Formula 1 in 1958 the 246 V6 was used again in 1961 as the power unit of Ferrari’s first mid-engined sports-racer, the 246SP. 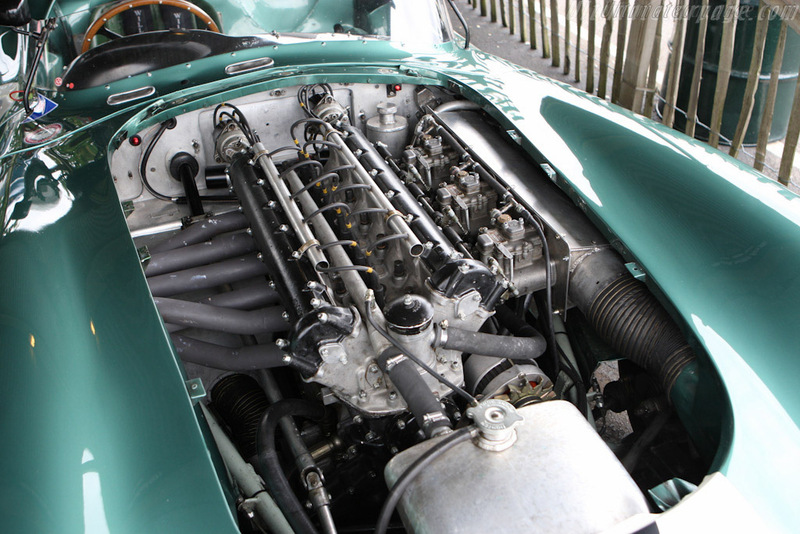 1959 Aston Martin RB6 2.9-litre six: In 1948 David Brawn acquired Aston Martin and Lagonda, the later contained a promising engine designed in 1945 by Willie Watson. 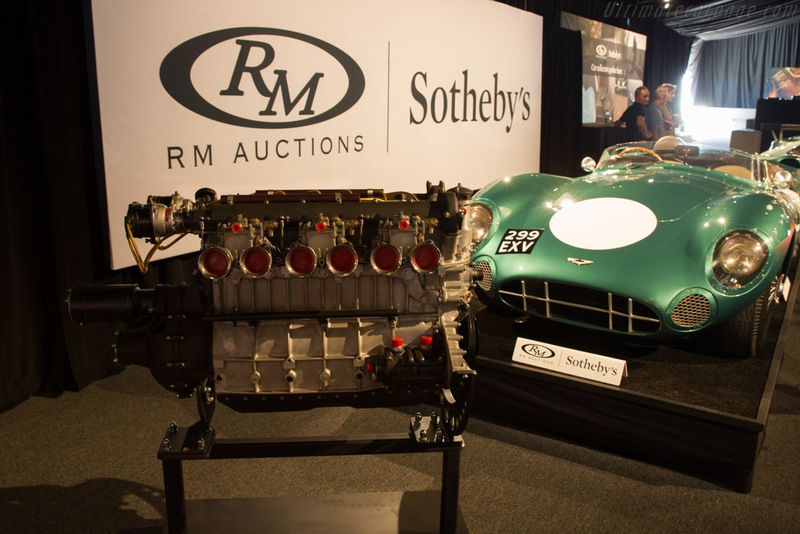 11 years later this same twin-cam six developed further powered Aston Martin DBR1/300 sports-racers to victory at Le Mans, Nurburgring, Goodwood and to the Manufacturers World championship for sports cars. In 1955 Ted Cutting designed a new aluminum block with 2-studs main bearing caps with the crankcase sides down 4-inches below crank center line so the main bearing caps could also be braced by cap-screws from the sides of the block. Centrifugally cast flanged at top cylinder liners clamped between head and block, the bottom end was snug-fit in a bore and sealed by O-rings. The block had 7-main crank bearings. Crankshaft machined from steel billets and ran in thin-wall lead bronze bearings by Glacier. A vibration damper at crank nose was used. Dry sump with single pressure pump and double scavenge unit were used. 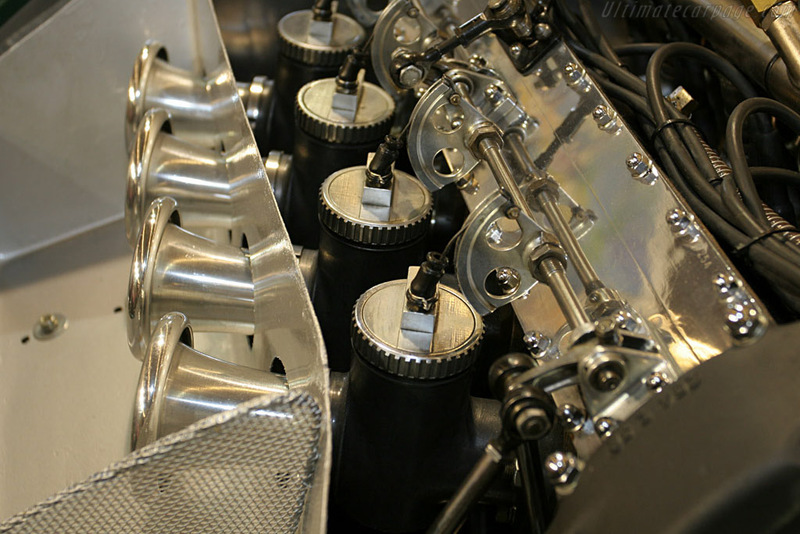 Deeply-webbed pattern fully machined from forged blanks con-rods with fully skirted Hepworth & Grandage pistons with 2 compression rings and 1 oil ring were used. Just before Willie Watson left Aston in 1955 a new aluminum cylinder head was developed, this head had extremely steep valve inclinations of 45 degrees from the vertical for the inlets and 50 degrees for the exhausts, it was fitted with cast iron valve guides for the inlets and bronze for the exhausts and carried the camshafts direct without bearing shells, the exhaust guides were directly exposed to the cooling water. Cup-type tappets slid in bores directly in the head and surrounded 2-coil springs per valve. 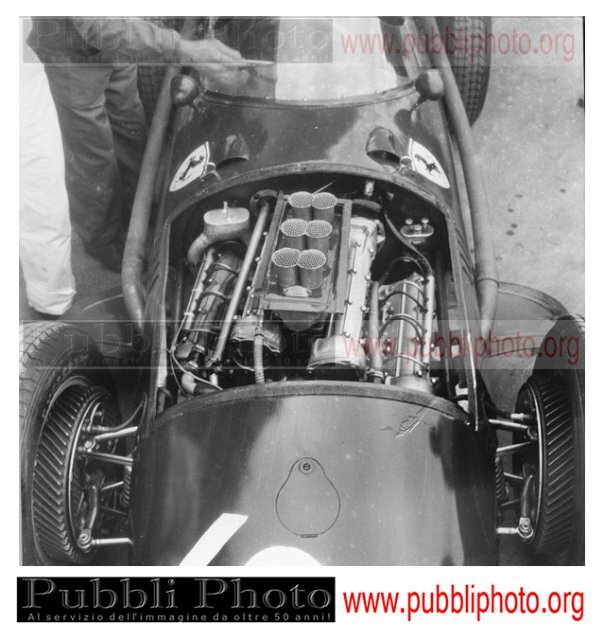 50DCO Weber carburetors with 40mm venturis were used. One short stroke engine version bringing the capacity down for the 2.5-litre formula 1 fitted with 2 Lucas magnetos firing 2 10mm-plugs per cylinder was developing its peak 250BHP@7800RPM, but sustained running above 7000RPM was causing bearing failure, the bearing people said it was because the rods were flexing, new rods did not solve the problem which finally was traces to oil flow in the drilling to the bearings at top center of rods journal stalling the flow by dynamic forces at high revs, moving the location of the oil drilling away from top center solved the problem. was it made on the same tooling ? if so - doesn't this mean that it had 3 crankpins ?